I was leary at first buying anything online labeled "Universal fit" BUT I am happy I did. Everything shipped and arrived on time and I received exactly what I ordered. For the price this is a very good investment especially if you have lighter colored seats it does it job pretty well. It may have been my misunderstanding of the description but I thought I was buying a one piece seat cover they did not fit my 95 dodge ram 1500 seats so not sure what truck they will fit. I am leaving a 5 star review for this because the item was as described and worked as expected. I was really happy with the finished result and love how my car interior looks now. However, the installation was much more involved than I originally expected. 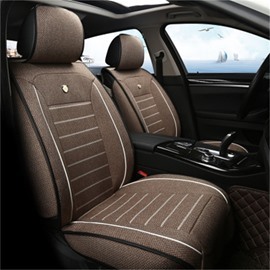 I rarely write reviews, but these seat covers deserve one! They're fantastic! 1. 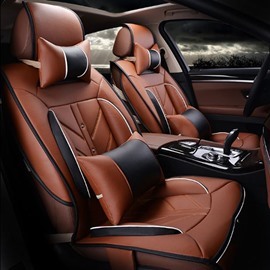 You can't find better (if any) seat covers for the price. 2. They're girly because of the pink, but not overwhelmingly so. 3. 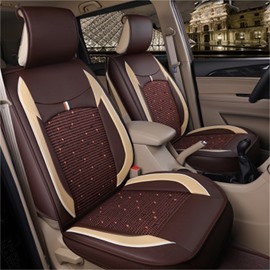 The set includes everything you need to spice up the interior of your vehicle... (2) 3-piece front bucket seat covers, (1) 5-piece rear bench seat cover, (4) seatbelt covers, (1) steering wheel cover, and hooks for proper installation. 4. Note that the pink is actually a BRIGHT pink, rather than the slightly darker pink that the picture portrays. I don't have an arm rest in rear seat on my 2005 chevy equinox. Will the bench seat cover look right?